When employers help make it easy for families to keep breastfeeding, mothers feel better supported and are more likely to reach their breastfeeding goals. Lorain County Public Health helps employers and community-based locations create programs, policies, and environmental supports that encourage healthy behaviors like breastfeeding. 75% of American women choose breastfeeding after delivery, yet only 40% continue breastfeeding after they return to work. One research study found that women who work at companies with policies to support breastfeeding are more likely to continue breastfeeding for at least six months—which is the minimum time recommended to breastfeed by the American Academy of Pediatrics. Research shows that breastfeeding benefits the health of mothers and children (it reduces risk for cancers and obesity) - and healthy employees benefit an organization! To help local mothers and employers build breastfeeding support, Lorain County Public Health designed Breastfeeding Support in the Workplace guide with local partners, working moms, and businesses. It includes policy templates, talking points, and recommendations to help new mothers feel better supported while breastfeeding or pumping at work. Click here to download a copy of Breastfeeding Support In the Workplace. To get a hard copy of Breastfeeding Support in the Workplace at no cost, contact Lorain County Public Health at 440-322-6367 or HealthEd@LorainCountyHealth.com. 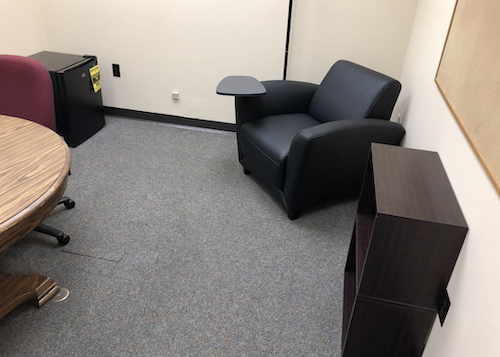 Lorain County Public Health recently partnered with Kendal at Oberlin and CoWork Oberlin to develop new policies and to set up lactation rooms that support breastfeeding women. Both Kendal and CoWork Oberlin now have lactation support policies and private rooms for breastfeeding women to use. Grants covered the costs of refrigerators for breastmilk storage, and comfortable seating. This photo shows the lactation room at CoWork Oberlin. Visit CoWorkOberlin.org/Inclusivity to reserve the room and for more information. These recent projects inspired other companies to proactively support working women. In fact the coworking community model for CoWork Oberlin, LaunchHouse now strongly recommends that their other locations in Northeast Ohio include lactation rooms. Local breastfeeding support doesn’t stop there. Lorain County WIC has breastfeeding peers on staff who support, educate, and offer realistic guidance to local families and new parents. Lorain County’s two birthing hospitals offer breastfeeding regular support groups and have International Board Certified Lactation Consultants on staff. Also, ask your OBGYN, pediatrician, or birthing hospital what education and support are available to help you feed your baby. The Breastfeeding Support in the Workplace guide and improvements at local workplaces were done in-part through Lorain County Public Health’s Creating Healthy Communities (CHC) program. The health department and CHC support these and similar collaborations throughout the county to help communities make the healthy choice the easier choice, and to reduce barriers to living a healthy lifestyle.